My soon to be eighteen year old daughter had other ideas. She believes an annual foreign holiday is a divine right. More persistent than a toddler demanding sweets she mounted her campaign. Holiday brochures offering everything from the cheapest package deals promising sun, pools and nightlife (which I read as loud music and drunken kids) through perfect family holidays to suit all budgets (other people’s kids noisily having fun) to bespoke itineraries for multi-millionaires (I wish) piled up; the corners of the pages presenting holidays she deemed suitable thoughtfully folded over. 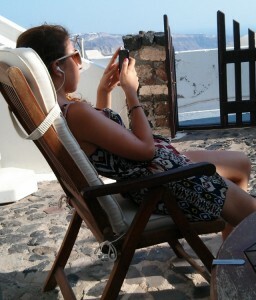 So that is how I come to be cooking myself and she sunning herself under the sun in Santorini. It is more than a little too hot for me but it is a long way from work and almost certainly a better break than lazing at home. I may be only the money source and an embarrassment on the beach with my white skin and hairy legs (notwithstanding the once in a decade painted nails) but exploring the volcano, walking the coastal path and sailing in the caldera has been pleasant and, I must admit, an excellent break from work. I only hope I will be able to say the same about the “Greek night” later tonight after the plates have been smashed and the tables danced. I’m not keen on enforced fun. Maybe if I take advantage of the unlimited drink I won’t remember it tomorrow.